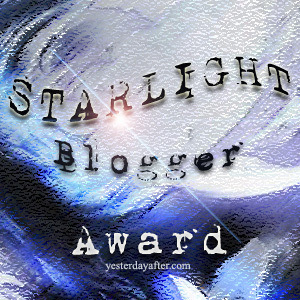 Please don’t delete this note: the design for the STARLIGHT Bloggers Award has been created from YesterdayAfter is a Copyright image you cannot alter or change it in any way just pass it to others that deserve this award. 1. How do you deal with a situation where you have nothing to write but want to write? 2. What changes (if any) blogging has brought in you? Answer: I do think blogging has brought a change in me, for one I have finally realized how important writing was to me, something I was pushed to do by a few close friends (still very few friends are aware of the blog I maintain) who thought I needed this and I had a way with words. Yet, I didn’t believe in my ability to write but my need to vent and let things out and here we are today. I have so many friends across the globe, I have eventually learned to broaden on topics I write and on most days am able to disconnect what I write from how I might actually be feeling. I’m still learning and got a long way to go but yes, diversity is important from where I stand now. 3. What would you like the legacy of your work to be? Answer: Most of you’re aware that my line of work has nothing to do with writing/literature at all. In-fact, there is nothing in common with what I do in my daily life and there is too big of a disconnect. However, I sincerely hope and pray that some day I will have the opportunity to write professionally and make a difference to some lives. I’m not looking for fame, I’m the sort of person who stays away from any attention but I’d like my words to be heard and maybe they could leave a lasting impression on somebody. 1. If you could turn back time, would you? why/why not. 3. One of your deepest fears is? Note: Thank-you Kri again, I know I have another post to respond to, bear with me 🙂 I’m grateful for the nomination and for the nominees; good-luck guys, as always feel free to participate or not but I’d love to see your responses. My mind has a will of its own; it drifts to random locations on random days without informing first. So I sat down with a blank canvas today to draw out my mind as I thought it was but as I sat on my wobbly chair, I couldn’t think of any solitary visual to draw on my canvas apart from pitch black void dancing across it. Hands shook and world swam in a blur of chaos and I lost my mind in this oncoming storm. In continuation of the “3 day quotes challenge” (please refer to the link for yesterday’s post), today I have shared a quote by another literary gem, a person favourite yet again; Anne Sexton. Her works speaks for itself, I need not to say anything about the above quoted words or the lady.